Walk and Climb on the famous Sólheimajökull glacier on the South Coast of Iceland. A truly unforgettable glacier tour experience in an icy wonderland. On this glacier adventure, we combine our popular glacier walk with an easy introduction to ice climbing. 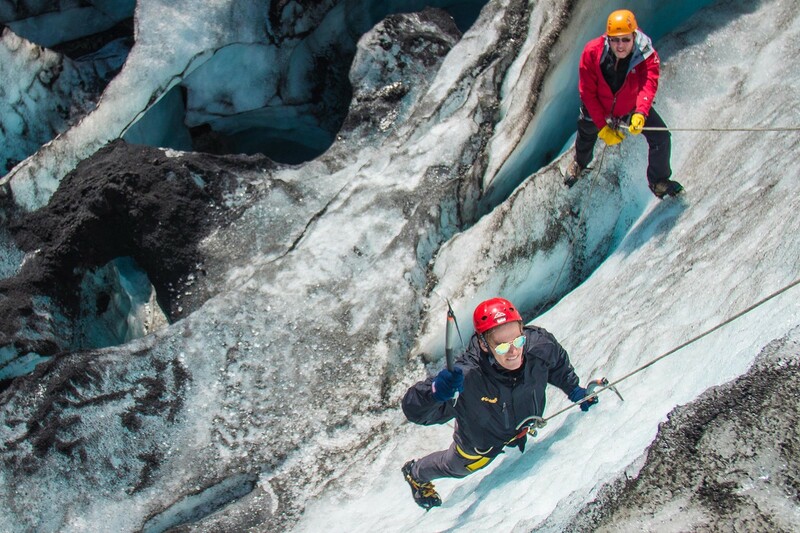 As we explore the majestic landscapes of Sólheimajökull glacier, including water cauldrons, ridges, and deep crevasses, we search for a suitable spot to rig up our gear for a short introduction to ice climbing. With our small group number of 6 passengers per guide, everyone will get a chance to have a fun and easy ice climbing experience. Don’t forget your camera, you will want to share this experience with your friends and family! I 100% recommend Icelandic Mountain Guides! I was looking at the brochure and thought if I can do the glacier walk and iceclimbing on one tour, why not do it?!... I'm so glad I tried this out!! The views are amazing on the glacier and would recommend this tour for anyone looking for an adventure/workout/great views, this is for you!